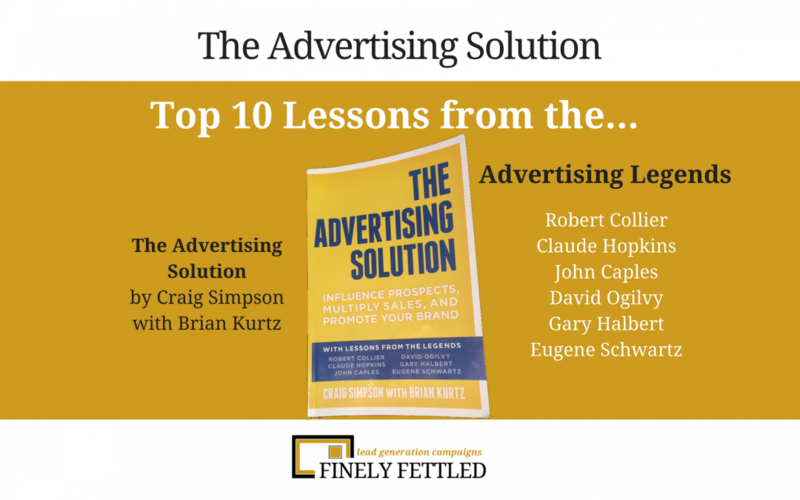 If you are about to put together an advertising campaign, then pay attention to these 10 lessons drawn from The Advertising Solution by Craig Simpson with Brian Kurtz. Robert Collier – who wrote The Robert Collier Letter Book in 1937. He dissected sales letters and formed formulas and rules that would generate appeal whatever he was selling. Claude Hopkins – wrote Scientific Advertising in 1923. He introduced the world to tracking adverts, couponing, free samples and measurement. John Caples – wrote Tested Advertising Methods which advised on copywriting and how to write headlines for example. What is impressive is his advice was based on tested outcomes, not opinion. David Ogilvy – is known as the ‘Father of Advertising’ and wrote about his advertising approach in Confession of a Advertising Man in 1963. He is credited with advising focus on ‘the Big Idea’. Eugene Schwartz – wrote Breakthrough Advertising in 1966. He was a master copywriter and understood what makes people tick. He is often referred to as the greatest ad man who ever lived. Gary Halbert – was an inspirational copywriter. Halbert told us that ‘any business can be changed by a great sales letter’. He wrote The Boron Letters whilst in jail on the secrets of persuasion. Let’s get to their combined lessons, as seen through the eyes of Craig Simpson and modified a touch by myself. Whatever it is you want to sell, you’ll need to have something that captures what it is so you can sell it to prospects. For many of us, the process of writing that starts with a blank piece of paper. You’ll need to do detailed research, whether that’s poring over technical reports or sifting through information you have about your product. How is it made, what it does, how it is an improvement over the competition? What is unique or especially high quality about your product? new Rolls-Royce comes from the electric clock. Gather the information BEFORE you start drafting your masterpiece copy. The information will inform you, stimulate your ideas and help you be more relevant to the eventual reader of your copy. Get beneath the skin of your prospect. Can you send them a questionnaire? Can you interview them personally? Can you deep dive into their culture? If you have a list of customers but don’t know their ages, their interests, or any information that will profile them, you can take immediate action and contact Finely Fettled now. Imagine the insight you will have by understanding the differences between your best customers those people you are targeting as new prospects. For example, if you identify that a decent percentage of your customers are dog owners, then including an image of a dog in your communications may lift your sales conversion. You can sort of speak their language. The profile will give you more ideas or the types of people you ought to be approaching with your offer. Gather and collate everything you have on your product. Read it over and over. Move pieces around, reorganise it. Allow your sub-conscious mind to come up with new connections, when you are busy with other stuff, in the garden, making dinner, shaving! Use your informed mind to refine the sales letter and change the language so that it appeals to your target audience. And remember, your letter is FOR THE ONE NOT THE MANY. Don’t shout but chat to the one person who is your audience. You will have a lot of parts to deal with in a campaign. Your headline needs to get people reading and want to read more. Do you have a guarantee? You might want to craft one sharpish of you plan on asking for money. Reduce the buyer’s risk. Make it easier for them to commit to you. Has your sales letter or webpage got testimonials? They are especially important to you. Social confirmation by someone who looks like your target audience can be very powerful. Are you adding vignettes or sidebars to your communication? These make it easier for scanners to read your document and consume more information, like FAQ, tables etc. In a direct mail letter, we do this with a lift. That’s like an additional piece of paper or several pages sometimes, that complements the main piece. Each part of your campaign brings its own benefit. Like your call to action. Why write an advertisement then fail to clearly tell the reader what to do next? That’s daft. Every part of your campaign must pull its weight. So many sales letters, emails, print ads are all about the business they are writing from. Like the email from a ‘security services’ business sent randomly this morning, with no opt-out, starting with “I am contacting you today…”. Then the second paragraph starts with “We offer a range of bespoke security solutions…” and the third paragraph starts with “I would love to discuss further our services…”. Your communication is written to attract people. One at a time. The best way to do that is to orient everything in your sales letter (webpage etc) to them. Start one-to-ne conversations, don’t shout at the crowd. Make your copy about them, the things they care about and how your services will fulfil those needs. A good way to do this is to ask your customers what it was they heard from you that persuaded them to spend money with you. Are You Passionate About Your Product? If your answer is even close to being no, re-write your copy. Passion is not a license to lie. Your enthusiasm can shine through your copy. You have real unwavering belief in getting the outcomes for your customers. So tell your story with passion. This might be a brightly coloured envelope. They tend to get opened more. Similarly, with direct mail, by adding a 3-dimensional object within your envelope, you are ramping up the curiosity factor and almost certainly moving your mailing to the top of the open pile. What can you do to make your business stand out from the crowd? Make your form of showmanship appropriate for the audience. If your communication is clear, then your advertising will improve. Here are 4 simple ways to remain clear. Use simple language – use short sentences. Avoid fancy words. Can everyone read your copy? – if your designer recommends yellow text on a white background, consider their credentials. If it looks hard to read, you can guarantee people won’t make the effort. Is your design attractive? – Headlines, sub-headlines, short paragraphs, sidebars, quotes, pictures, graphics. They all count. Have a clear call to action – Don’t ask, don’t get. Tell people what to do next, few of us take the initiative. There are more advertising media available today than ever before both online and offline. Consider your budget carefully. Where does your audience hang-out? If they read newspapers they are probably older individuals. If it is largely social media, it is still a fairly-young demographic. Accept nothing as true about advertising until you’ve testing it yourself. As you test the results of each ad, use what you learn to create an improved version, and then test that. Every new ad is a test of what worked before. If you are looking for help with your next direct mail campaign, get some free consultancy prior to making the leap. Call me and let’s discuss what you have done so far and what you’d like to achieve. Alternatively, listen to Brian Kurtz, co-author of The Advertising Solution on my podcast – The Next 100 Days.